This image was produced by combining a dozen Chandra observations made of a 130 light year region in the center of the Milky Way. The colors represent low (red), medium (green) and high (blue) energy X-rays. Thanks to Chandra's unique resolving power, astronomers have now been able to identify thousands of point-like X-ray sources due to neutron stars, black holes, white dwarfs, foreground stars, and background galaxies. What remains is a diffuse X-ray glow extending from the upper left to the lower right, along the direction of the disk of the Galaxy. The spectrum of the diffuse glow is consistent with a hot gas cloud that contains two components - 10-million-degree Celsius gas and 100-million-degree gas. 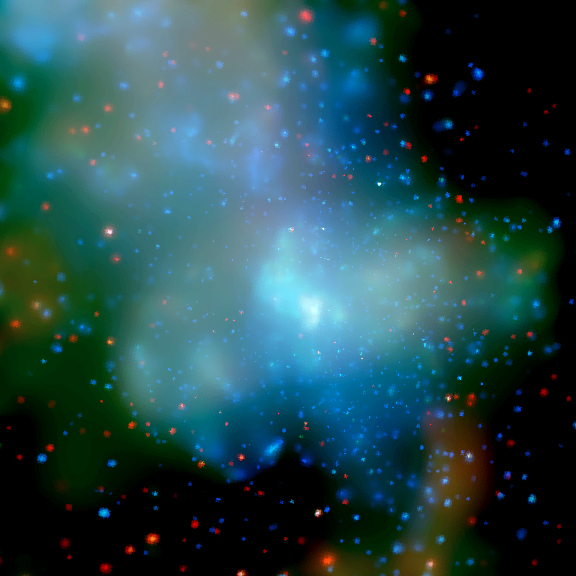 The diffuse X-rays appear to be the brightest part of a ridge of X-ray emission that stretches for several thousand light years along the disk of the Galaxy. The extent of this ridge implies that the diffuse hot gas in this image is probably not being heated by the supermassive black hole at the center of the Milky Way, known to astronomers as "Sgr A*". Shock waves from supernova explosions are the most likely explanation for heating the 10-million-degree gas, but how the 100-million-degree gas is heated is not known. Ordinary supernova shock waves won't work, and heating by very high-energy particles produces the wrong spectrum of X-rays. Also, the observed Galactic magnetic field appears to rule out confinement and heating by magnetic turbulence. It is possible that the high-energy X-ray component of the hot gas only appears to be diffuse, and is in fact due to the combined glow of an as yet undetected population of point-like sources, like the diffuse lights of a city seen at a great distance. The difficulty with this explanation is that 200,000 sources would be required in the observed region. Such a large unresolved population of sources would produce a much smoother X-ray glow than is observed. Furthermore, there is no known class of objects that could account for such a large number of high-energy X-ray sources in the center of the Milky Way. 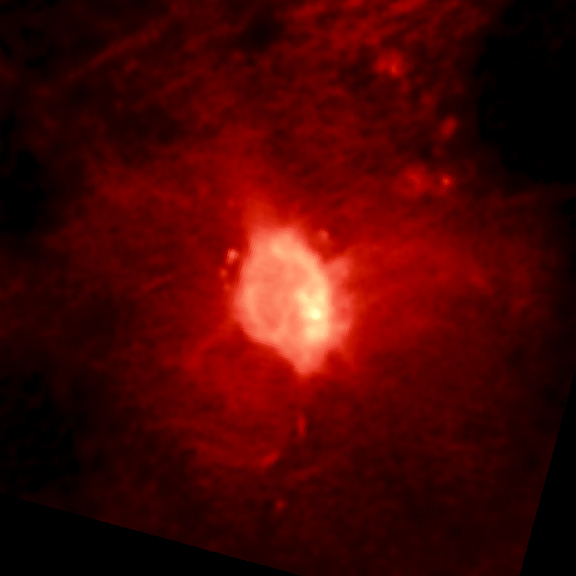 Scale Image is 16 arcmin across. Coordinates (J2000) RA 17h 45m 40s | Dec -29° 00' 28"